The Perfect Holiday Gift – one that makes a difference! This time of year, when we show our care for others, is the perfect time to help make a difference in the recovery of one of Earth’s most endangered species, the North Atlantic Right Whale. How? By giving the gift of a Right Whale sponsorship as part of The North Atlantic Right Whale Research Program of the New England Aquarium. The Right Whale is a species that has been hunted to near extinction; a species whose habitat along the coast of eastern North America is one of the most congested, industrial, and urbanized pieces of ocean in the world; a species that, while no longer hunted, is still under intense survival pressure due to high mortality from ship strikes and fishing gear entanglements. 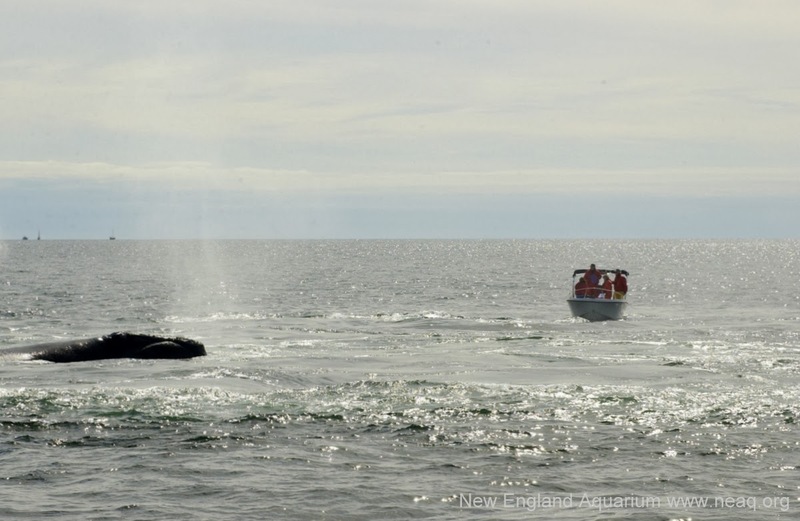 Today, fewer than 600 North Atlantic Right Whales remain in the entire world. But, we’re working hard to change all that. 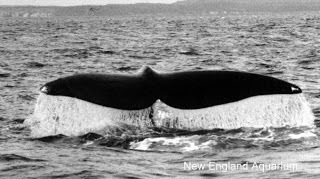 Started in 1980, The Right Whale Research Program of the New England Aquarium is one of the longest continuously running whale research and conservation programs in the world. Working with government, scientists, the shipping industry, and commercial fishing interests, the Right Whale Research Program seeks to find ways to assure the continued survival of these magnificent animals. One of our research teams at work! Tax-deductable sponsorships are available at many different levels and go directly towards the research and conservation work focused on saving this most endangered whale. 100% of your sponsorship dollars will go towards supporting this critical cause, so you know your contribution will help in making a difference. 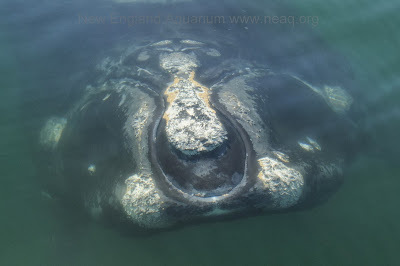 To find out more on how you can sponsor a North Atlantic Right Whale please visit www.neaq.org/rwsponsor . On June 27, 2010, a right whale was found floating dead and entangled off the New Jersey coast by the U.S. Coast Guard. Over the next several days, the carcass was towed to a site in Delaware Bay where it could be fully necropsied (an animal autopsy). By the time it made it to the beach, there was very little skin left on the animal and virtually no detectable features left to help identify him to a whale in the Catalog. A skin sample was collected from him, but until recently his identity remained unknown. Tips' left fluke tip photographed on September 9, 2009 (Amy Kennedy/New England Aquarium) and after his death on June 27, 2010 (U.S. Coast Guard). That is until 10 days ago. While reviewing some images in preparation for the North Atlantic Right Whale Consortium meeting, I found one image taken by the Coast Guard that showed some distinctive scars on a fluke tip that had been overlooked. I knew those scars. With a sinking feeling, I called up comparable images from the Catalog and had my suspicions confirmed - those marks belonged to an old friend- "Tips" (Catalog #1124).This match was further supported by looking at the head of the carcass with this potential ID in mind, and by looking at his sighting history which showed he had not been seen since January of 2010. The genetic sample is still being processed, but the preliminary results are also consistent with this identification. Tips in the Bay of Fundy on September 8, 2009 (Philip Hamilton/New England Aquarium). Tips was first seen in 1980 and his fluke tips were already scarred way back then (thus earning him his name)- so he could have been an old whale at his death. He was known for a couple of particularly interesting behaviors. He had been seen frequently close to land up in an unusual area in the Bay of Fundy- close to land and north of the usual distribution. He was seen repeatedly in this area near "The Wolves" in 1980, 1981, and 2009. He was also known for swimming circles around boats, blowing bubbles under water as he did so. Most right whales ignore boats (or avoid them)- so this behavior was unexpected. We may never know why he did this. Tips' skeleton will be maintained as part of the Smithsonian's research collection in Suitland, MD. Every right whale death is sad, but this one is more poignant to many of us because of Tips' rich history. He will be missed. Tips off The Wolves in August 18, 1981 (Scott Kraus/New England Aquarium).